Front cover: What’s wrong with this picture? This newsletter was meant to arrive on April 1st, but printing problems slowed it up. The base hotel this year will be the Shilo Inn, 2020 Prospect Avenue, Helena Montana 59601. The phone number is 1-406-442-0320. Tell them that you are with the Montana Cross Country T Assn. to get our special rate. There is more info on the website, if you need it. 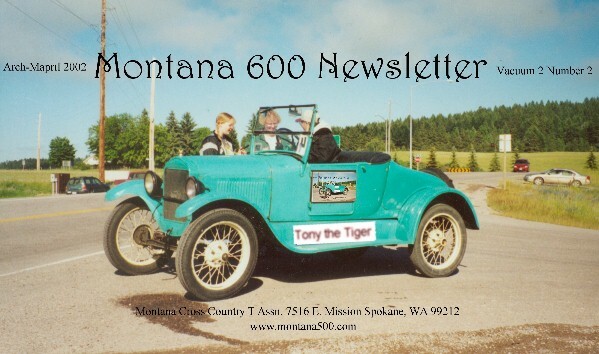 Each month I send out about 100 copies of the Montana 500 newsletter. If there are any pages with pictures I print them with my laser printer. Pages with text only I do on my Risograph printing press. Pages with any color I do on my inkjet printer. A typical newsletter has four color pages. Last month there were seven color pages. To print out at a decent quality on my inkjet, I have to slow the machine down to where it takes two minutes to print a single page. 700 times two minutes equals about twenty-four hours of printing time. This wouldn’t be too bad if I could set the printer up and go to bed or something, but I can’t. I have to baby sit the machine because it misfires about every third page. Especially if the pages have been printed on one side already. I have looked into sending them out to be printed, but it would cost about two dollars per issue to do so. There are six issues per year, which would exceed the amount of the dues by two dollars per member. A suggestion was made to raise the dues at the fall meeting, but was shouted down. One director even suggested that we should lower the dues to five dollars? If we continue the newsletter in its present format, we are going to have to reassess how we do it. Please give it some thought, and let me know what you think. Click this link to see the 2002 rules. Frank Iverson came from Ledger, Montana - or was it Conrad? In the past, drivers had signs on their cars to tell their hometown. Sometimes Frank was from Conrad and sometimes he was from Ledger. Frank first entered the Montana 500 in 1965. That year he drove a black 23-5 roadster. He finished 18th that year. The last year he ran was in 1981. He came in 19th that year. The rest of the time his finishes were always in the top ten, and usually in the top five. In 1970 he won and was written up in both Road and Track and Rod and Custom magazines. I once heard a lady say that Frank had "movie star" good looks. That might be the case, but the real looker was his car. The "Roadrunner" was a beautiful 26-7 blue roadster. In 1975 my windshield stanchion broke and Frank offered to let me use his welder to fix it. There in his shop was a one of his secrets to success. He had a Model A motor hooked to a stand that he would use to "run-in" his T motors. He called it "burnishing" the bearings. The "Roadrunner" car now lives in Portland, Oregon. Frank still lives in Ledger - or is it Conrad? There have been about 200 drivers enter the Montana 500 over the course of the last 40 years. Almost everyone who enters comes back another year to try it again. In fact about 80 percent of Montana 500 drivers return after their first try. Not including current drivers (folks who have entered in the last five years) to date, there have been 34 people who have only entered one endurance run, they are: Judge Brownlee, Jim Gendreau, Joe Hoover, Norman Kerr, A. B. Lee, Melvin Lingle, Claude Sims, Tom Stanton, Tom Watson, Paul Winebarger, Arndt Zeller, Walt Mangold, Frank Schuler, Merle Clark, Clint Derby, Jim Faught, Bob Hunt, Laurin Cowling, Jeff Danielson, George Teves, Mavel Rector, Hugo Rintala, Hank See, John F. Cipra, Jr., C. E. "Andy" Anderson, Jim Stout, Ross Anderson, Jon DeVick, John Morris, Jon Bodine, Craig Rang, Jack Engdahl, Cort Strobel and Joyce Smith. Of these 34, eleven were from the first year. Why there was such a drop out of first year people is beyond me. Of the remaining people, I only know one of them and that is Jon Bodine. I have been in touch with him and he says that he would like to come back some day. Jon ran in 1977 in a coupe. It was a bone stock original car right on down to the cast iron pistons. It never missed a beat in 500 miles and Jon finished with an respectable average speed of about 45 miles per hour. Too often we focus on the drivers but leave out the unsung heroes of the Montana 500. I'm talking about the timers and the flaggers. This is my first profile on a timer. I first met Newt on the 1968 run. There were two things that stood out on the man. One was that he kept five stopwatches around his neck at all times. The other was that he had a huge right thumb. It was easily three times the size of his left thumb. I once asked him why his thumb was so big. I thought that it might be the result of an injury. He just gave me a sort of disgusted look and proceeded to wind one of his watches. He never did tell me why his thumb was so big, but some people speculated that it was from starting and stopping his watches. I once asked him why he carried five stopwatches. His reply was "being prepared beats being repaired". It made perfect sense to him. Newt worked for the Montana Clock Company. He worked in the hour hand department. Things were slow there, so he transferred to the minute hand department. Newt quit timing for us when Mr. Anderson took over the head timing duties. Some people say that he left because of jealousy. It could be true - most people think Anderson is a better timer than Newt Day. The forty-first and a half running of the Montana 500 was held April 1st 2002. Many folks from previous races showed up. The first leg was from Havre to Ft. Benton, then to Great Falls. 15 minutes into the first leg, Tom Carnegie's car quit never to enter this race again. Apparently his transmission came down with a bad case of rheumatoid arthritis and would no longer function properly. Tom was quoted as saying, "I've never had that happen before." The most notable thing to happen on this leg was Rob Flesner's rear axle problem. It seems that Rob had procured a 12-tooth pinion to mesh with his 40-tooth ring gear. He knew it was against the rules, but he wasn't shooting for the top three anyway. Anyway - somehow through some mechanical error he had two reverse speeds and only one forward. So, with his left foot planted firmly on the center pedal - away he went. He didn't make bad time either, as the wind was blowing nearly 100 mph. In fact, Ron Miller found that he could make better time by cutting his engine and using the windshield of his 1915 T as a sail. Tony Cerovski discovered that by mixing a combination of mothballs, Marvel Mystery oil, acetone and a special ingredient mined in Atlantis in exactly the right proportions, and adding this to his gas, that his model T could travel at virtually unlimited speed. Tony could only run his motor for a couple of revs, then he had to shut it off, or it would go too fast. Tony is in 5th place right now, but we expect him to move up, as he becomes more adept at manipulating his ignition switch. There was an incident just outside of Loma where the switch stuck in the "on" position for a few too many seconds. The result was a burned out brake band, some flattened corn and a startled cow. Steve Coniff is running well this year as usual. He is running his new multilobe camshaft. It has three lobes per lifter. "It gives me the exact duration I'm looking for, plus the lift is cumulative" explains Steve. The first night we all pitched tents at Scott Stubbert's place - even Scott. "It didn't feel right sleeping in a bed when no one else was." said Scott. Harold Mann slept in his pick-up box and Art Hedman in his turtle deck. "It's kind of cramped," said Art "but it was really warm in there." The next morning Mark Hutchinson had a bad feeling about his motor and swapped it out for a spare that he was carrying in a small trailer that he had been towing behind his T. "I know I will be disqualified, but I think it would be nice to let Rob beat me this year." Mark was heard to say. The high light of the second day's run was the marvelous performance turned in by Dave Huson. Seems he caught a draft off of a low flying airplane that towed him all the way to Miles City. Too bad the rest of us were headed to Missoula. At the end of the second day Ted Ballard was in the lead by just a little over an hour. That night we all pitched tents in the Wal Mart parking lot. The third and final day there was only one leg. From Missoula to Fairview - just over 500 miles. Sam Nickol pulled a few strings and called in a few favors and got a refueling squadron to fly up from Mt. Home Idaho to refuel the T's en route. It was on this leg that the second T broke down. It was Mike Robison. I overheard him saying "I thought eight spare radiators would be enough!" Where were the women this year? There was a rumor going around that the directors banned them because they weren't "stock equipment" on a model T. This sounds fishy to me. I prefer to believe the story I heard which had something to do with Bonnie Nickol and a quilt show or something like that. The top five finishers were Ted Ballard, Steve Coniff, Bud Peters, Rick Carnegie and Tony Cerovski. 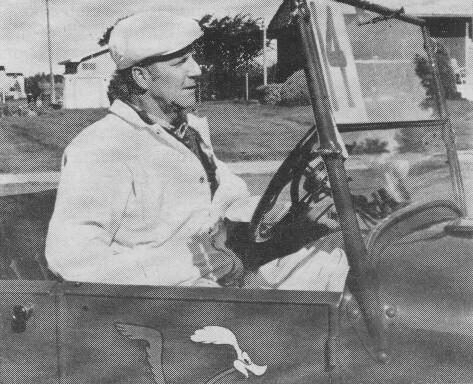 At the post race tear down Ted Ballard was disqualified, as it was discovered that he was driving an MG and not a model T. "He seemed like he was going awful fast" was the comment made by Doug Langel. "We should have spotted it at the pre race inspection" opined Josh Billmayer - and he's right, we should have - but in our defense the .710" gauge wouldn't go through the carburetor. Next was Steve Coniff. The directors voted to disqualify him because it was discovered that he had two coats of wax on the body of his T. Wax is not stock. "Besides," said one of the directors, "your car is just too darned red. "Body color is optional, but your paint is just too optional." This moved Tony into third place. The tear down inspectors were surprised to find that only two bolts were left to hold on Tony's cylinder head, and they were loose! The final, official top five places: First place, Bud Peters. Second place, Rick Carnegie. Third place, Tony Cerovski. Fourth place Doug Langel. Fifth place was awarded to Gary Ebbert. He didn't finish there, but we awarded it to him because we love his wife's accent! Steve Coniff is recovering from a strange tropical illness. Apparently he ate a tainted banana which caused his liver some distress. He looked in the mirror one day and he was bright yellow. "This ain’t right", he thought. A trip to the hospital, some body plumbing, some anti-biotics, and he’s as good as new. Steve was quoted as saying "I’d rather be a good liver than have one". Anna Carnegie-Marx, last year’s women’s champ is now a mommy. She had a girl that she calls "Emma" which is short for Emerald. As such, Rick Carnegie is now a grandpa. I have heard from people that need cars to drive in the Montana 500. If you know of any cars available, please let me or someone else in the club know. We have had inquiries from Australia. No one from outside the U.S. to date has entered the Montana 500. The MTFCA, of which we are a chapter has unceremoniously pulled the plug on their internet forum. They say that they will be back with a mo’ better forum really, really soon. I used the forum on occasion to let people know about the Montana 500. Rob Flesner got into a slight accident. Apparently someone tried to pass him in a no-passing zone. Rob is OK. The left side of his model T is not. He says it will be fixed by June 16th. Did you notice that I didn’t say a thing in this newsletter about not having race results for 1963?